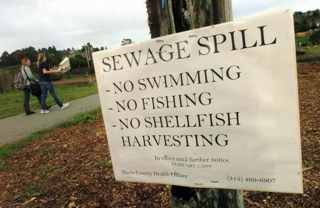 North Marin Water District manager Chris DeGabriele this afternoon announced, “Cleanup of the sewer spill which occurred Monday, Feb. 18, in the Oceana Marin subdivision [of Dillon Beach] has been completed. “Sewage debris deposited on the steep hillside where the sewer spill occurred has been removed. Staw wattles, jute netting, and native grass seeding have been applied to the affected area to help prevent erosion and limit sediment from entering the drainage swale and storm drain that flows to the ocean.” The swale is downhill from where the sewer pipe broke, apparently because tree roots damaged a joint. The spill was relatively small; initial estimates were that it totaled something over 250 gallons, some of which reached the ocean and some of which ended up in the swale and on the hillside. A Dillon Beach resident discovered the spill Monday afternoon and notified North Marin, which in turn notified county, regional, and state regulatory agencies. NMWD repairmen, along with a truck from Roto Rooter, were dispatched to Dillon Beach, which took them through the town of Tomales. As it happened, the Tour of California bicycle race stopped traffic in and out of Tomales for more than an hour that afternoon, but DeGabriele assured me that the bicyclists were long gone before his crew needed to get through town. “Results of tests completed by the County of Marin from the ocean-water samples taken on Tuesday, Feb. 19, show bacteria levels are much lower than the acceptable [maximum] standard, indicating the ocean water is safe for body-contact recreation,” DeGabriele reported. 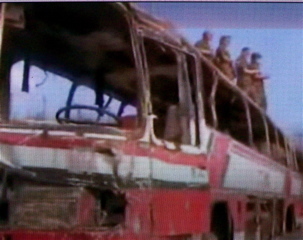 As a result, “warning signs and precautionary tape keeping people away from the area have been removed. “Today the inside of the affected pipeline is being remotely inspected with a television camera to determine if areas other than that which failed on Monday afternoon may need repair. NMWD’s contractor will begin repair of the pipeline early next week. 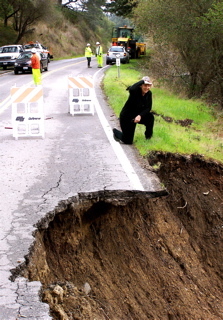 “NMWD provides sewer service to 222 homes in the Oceana Marin area,” the North Marin manager noted, and “17 of these homes are connected to the sewer-collection pipeline which failed. 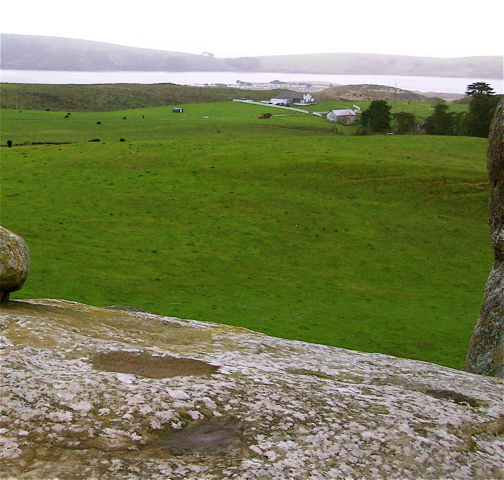 It is easy to underestimate the power of coincidence; nonetheless, I am surprised by a sudden rekindling of interest in The Point Reyes Light and West Marin Citizen as representing two poles of community journalism. A German journalist, Stephan Russ-Mohl, showed up at my cabin yesterday to interview me about the changes at The Light since I sold it two years ago. 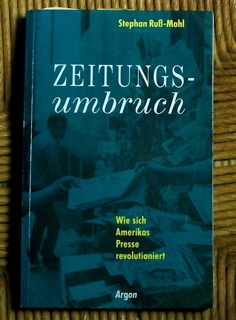 In 1992 while teaching Journalism at the Free University of Berlin, Russ-Mohl authored Zeitungsumbruch: Wie sich Amerikas Press revolutioniert, which devoted a chapter to The Light. Unfortunately, I can’t read it. Apparently the passage complains about “die amerikanische Provinzpresse” losing the courage to become indignant. Another book that devotes a chapter to The Light is Pulitzer’s Gold, which has just been published by the University of Missouri Press and is selling remarkably well. 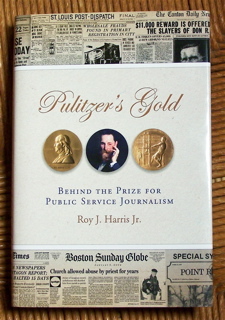 Engagingly written by Roy Harris (senior editor at CFO magazine), Pulitzer’s Gold looks in detail at what the 12 most-recent winners did to earn the Pulitzer Prize for Public Service, which Joseph Pulitzer considered his top prize. The Light won its gold medal in 1979 for an exposé of violence and other wrongdoing by the Synanon cult. Pulitzer’s Gold notes that Robert Plotkin now owns The Light and concludes its chapter on the newspaper: “Though new to Marin, he has grand ideas. ‘This is going to be the Paris of the twenties. This is going to be the Beats of San Francisco in the fifties.’ Talent will gravitate to The Light, he says, because it is still known, even back East, as the little California paper that won the Pulitzer Prize. 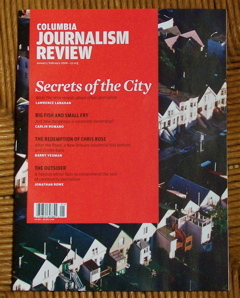 Meanwhile Point Reyes Station journalist Jonathan Rowe’s article, The Language of Strangers, in the January-February Columbia Journalism Review continues to generate discussion. 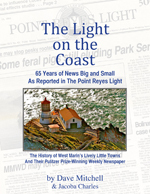 The article describes the new incarnation of The Point Reyes Light and the advent of The West Marin Citizen. 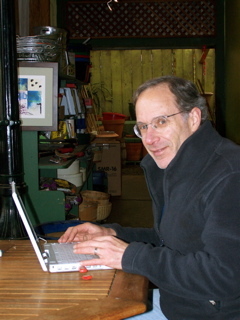 A flap erupted when Peter Byrne, a columnist for an alternative newspaper, The North Bay Bohemian, posted an angry comment on CJR’s website where Rowe’s magazine story was online. I subsequently saw Mery in Toby’s Feed Barn and remarked on his response to Byrne’s commentary. 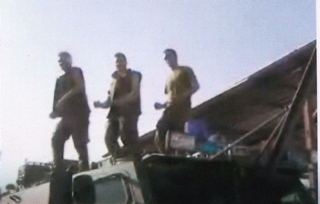 “It was drive-by journalism,” Mery said with a laugh. 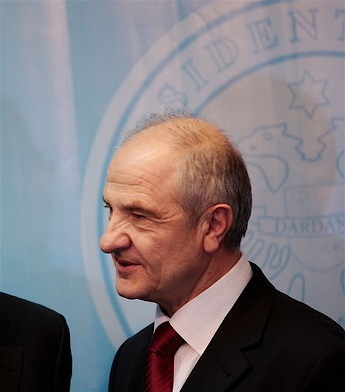 Although Mery came up with the clever turn-of-phrase on his own, he’s not the first to use it in describing a smear written by an out-of-town journalist who shows up only briefly. 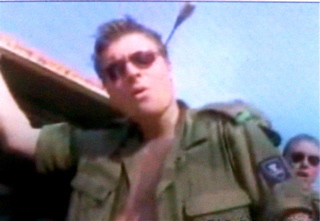 In fact, there is a book with that title by an author named Rowse (not to be confused with Rowe). The Point Reyes Light controversy shows no sign of letting up any time soon, which no doubt explains why Sausalito-based Marin Magazine has now arranged to publish a lengthy excerpt from Rowe’s article. * German slang that translated literally means: “All I understand is train station,” which is comparable to saying, “It’s Greek to me.” How do I know this and not know German? A little Vögelchen told me. 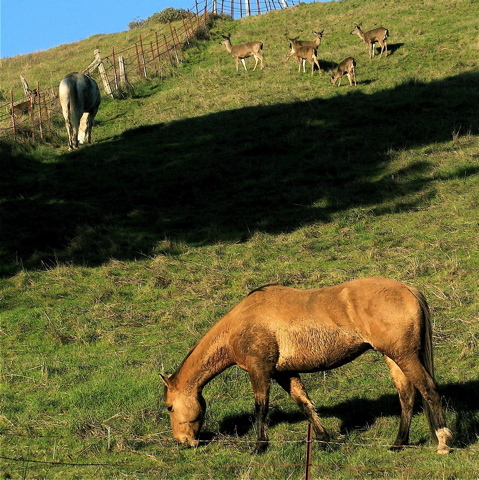 A herd of up to nine blacktail deer have taken to spending their days on this hill, here joining the horses of Point Reyes Arabians for a late-afternoon snack. 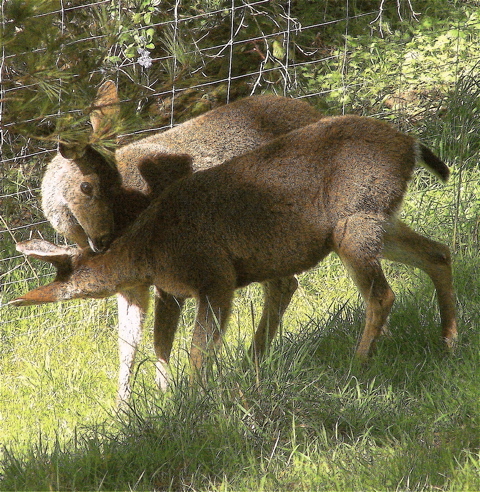 California’s Department of Fish and Game has estimated that well over half the roughly 560,000 deer in California are Columbian blacktails, the deer native to West Marin and the San Francisco Bay Area. Mutual friends. Two blacktail does licking each other’s coats. For years many people believed (and many websites still say) that blacktails are a subspecies of mule deer, a species found from the Northwest to the deserts of the Southwest and as far east as the Dakotas. 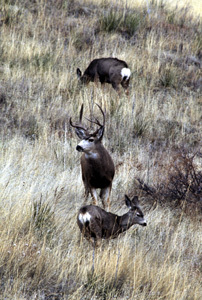 DNA tests, however, have now found mule deer to be a hybrid of female whitetail deer and blacktail bucks. Or so says author Valerius Geist in Mule Deer Country. Mule deer as seen on the website of Wind Cave National Park in the Black Hills. 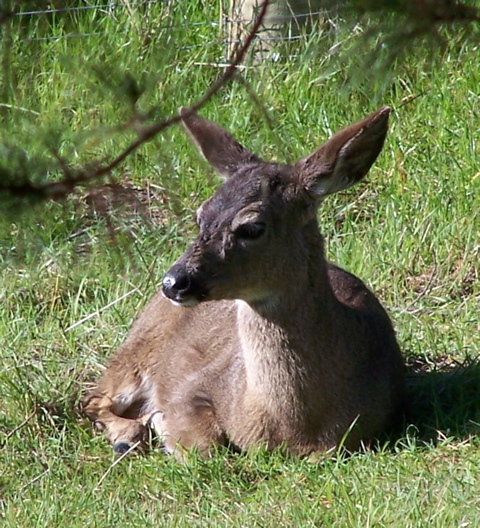 The deer are so named because of their long ears. And for an amazing look at a whitetail deer, check this YouTube clip of one running into the path of a motorcycle on a mountain highway — but avoiding a collision by jumping over the biker as he ducks. Happy Valentine’s Day! from a flock of Canada geese and from SparselySageAndTimely.com (or WestMarinNews.com for those of you using the URL that’s easier to type). 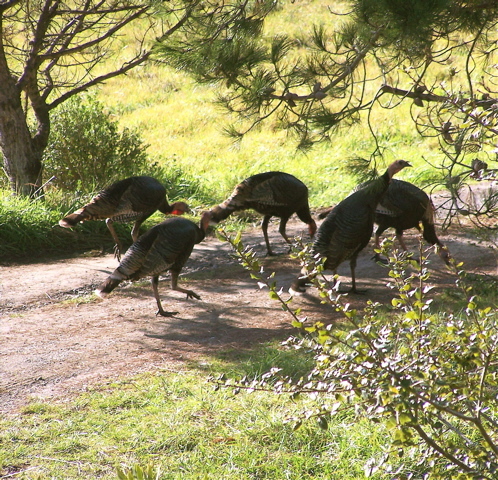 This photo, which I post annually for Valentine’s Day, was shot from my deck. Inverness Ridge is in the background. 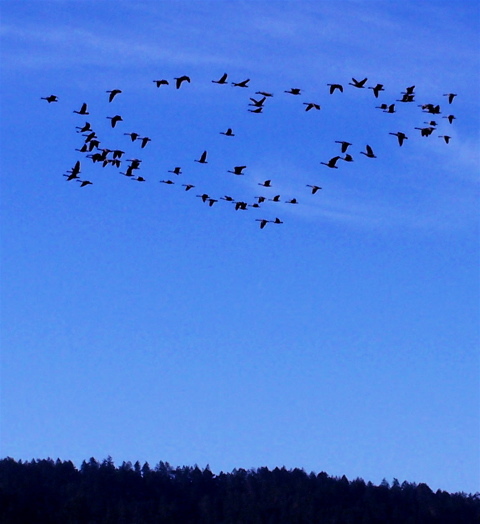 For the sake of West Marin’s lovers, let’s hope the goose hangs high this Thursday. That odd-sounding expression, which was more common a century ago, means everything is wonderful, presumably because geese fly higher in good weather. A fascinating article in Wednesday’s Marin Independent Journal reveals a “second massive sewage spill” at the same Mill Valley treatment plant discussed in the last posting here. The total amount of sewage spilled in one week is now put at 5.2 million gallons. Because of a bureaucratic snafu, the Jan. 25 spill of 2.45 million gallons into Richardson Bay, an arm of San Francisco Bay, didn’t come to light until after last Thursday’s spill of 2.75 million gallons. 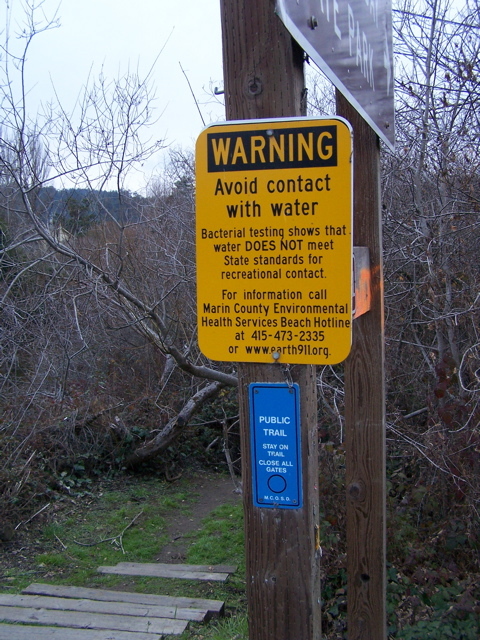 As the article by reporter Mark Prado explained, the Sewerage Agency of Southern Marin (which owns the treatment plant) should have immediately notified the Regional Water Quality Control Board after the first spill but instead emailed notification to the regional board’s parent body, the State Water Resources Control Board. A typo in the email resulted in the date of the spill being given as Jan. 15 instead of 25. Seeing the date, a state employee put the email aside, assuming it dealt with a two-week-old event, the newspaper reported. When the regional board finally learned of the earlier spill, The IJ added, they too were confused by the typo — until yesterday. “Health officials posted signs at beaches and waterfronts along Richardson Bay warning people of the contamination last week after the second spill was disclosed,” The IJ noted and showed such a sign, which was photographed by Jeff Vendsel. Why the sign looks almost as serious as the one below that health officials posted many months ago next to the Green Bridge! The Marin Environmental Health Department in early January told me this sign should have been taken down in October and would be right away. It’s still there. So why was this sign along Papermill/Lagunitas Creek posted in the first place? Did millions of gallons of sewage also spill into the creek? Did any sewage spill into the creek? 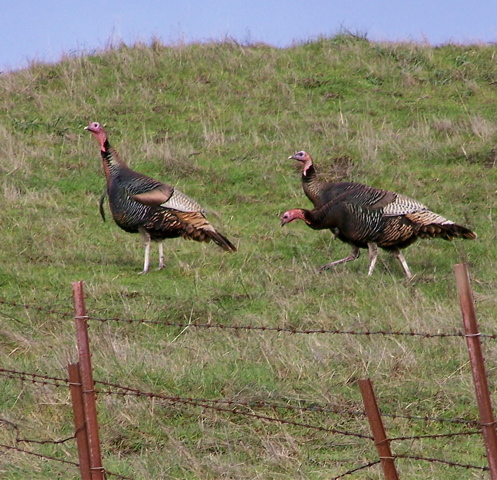 Not according to North Marin Water District. North Marin monitors water quality in the creek because it draws the drinking water for Point Reyes Station, Olema, and Inverness Park from creekside wells. As was noted here in Posting 94, North Marin’s tests of Papermill Creek’s water have found only normal amounts of bacteria, including e-coli bacteria, NMWD senior chemist Stacie Goodpaster told me. After a rain, of course, the amount of bacteria in the creek goes up temporarily, Stacie noted, because bacteria get washed into the creek. Marin Environmental Health later confirmed there was no indication of a sewage spill into Papermill Creek. Supervising health inspector David Smail told me that under state standards for Recreation 1 (swimming) freshwater, the maximum number of enterococcus bacteria per milliliter is 61 in a single day’s sample (104 for saltwater). The last sampling at the Green Bridge, which followed unusually heavy rains in October, resulted in an enterococcus count of 63 (only two over the limit), but under established “protocol,” that requires a sign, David said. And despite the “avoid contact with water” line in the county sign, Papermill Creek did not test unsafe for boating (Recreation 2). So the “avoid contact” part wasn’t accurate even at the time the sign first went up. But who’s to care? Runoff from heavy rain carries apparently normal amounts of soil, plant debris, and wildlife waste from forested parkland into Papermill Creek; doesn’t that warrant posting warnings at least as dire as those for a 5.2-million-gallon sewage spill? 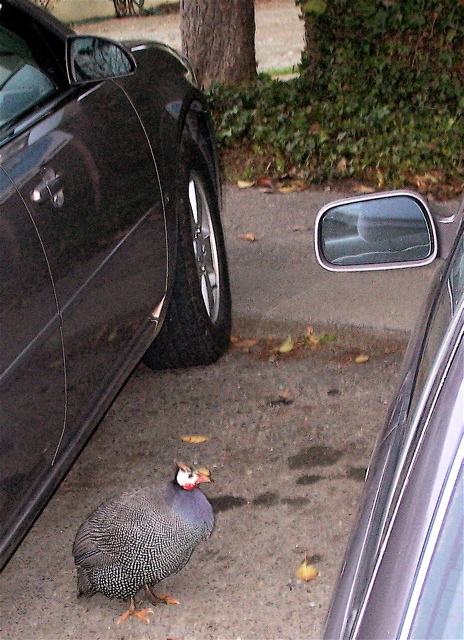 Needlessly alarming West Marin’s tourists and local residents doesn’t really matter, does it? 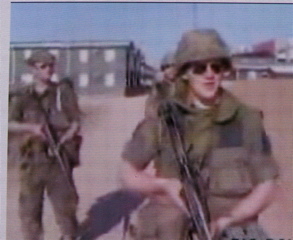 It’s just bureaucracy fubar. Or crying wolf. Sparsely Sage and Timely is powered by	WordPress 4.9.10 and delivered to you in 0.423 seconds using 39 queries.